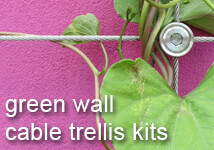 Our wire trellis kits are ideal for creating tensioned stand-off systems to your own specifications. 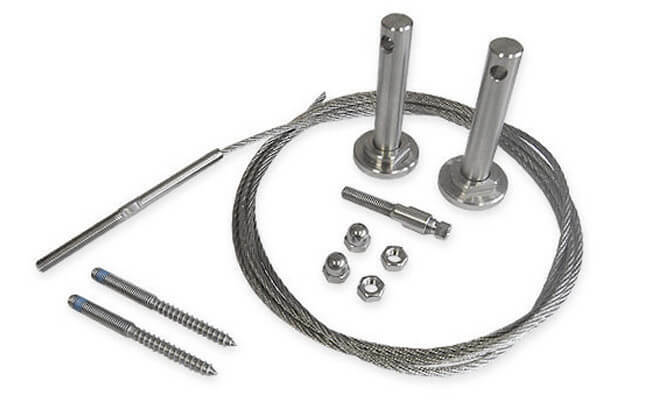 Designed and manufactured in the UK for strength and durability, these kits are perfect for high load applications and large scale installations. All components produced from 316 marine grade stainless steel, ensuring this product will stand the test of time. 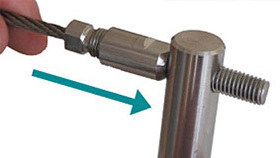 Each tensioned trellis kit comes complete with a stainless steel stud already fixed at one end of the wire rope, with our innovative compression fitting supplied to attach at the length you require. 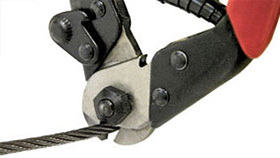 Ideal for a quick and easy installation onto masonry and hardwood timber with the use of a few simple tools. 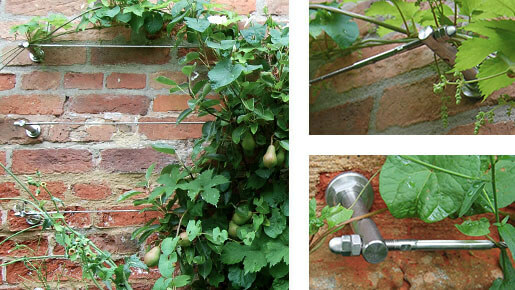 Incredibly versatile - giving you complete control to create ambitious and stunning wire trellis installations at an affordable price. The tensioned cable trellis system can be mounted either vertically or horizontally onto hardwood timber, masonry and block surfaces. 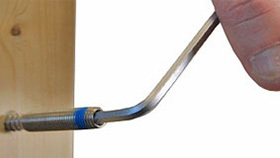 The dual thread pin allows direct installation into hardwood timber (such as oak) and if combined with the correct plastic anchor it is attachable to almost any masonry surface. 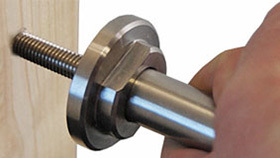 Cross hole alignment can be achieved by simply turning the adjustable base plate of your hub in or out, this will also ensure a secure fixing. 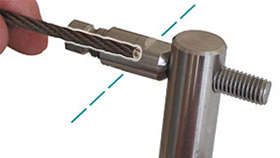 The dual thread pin allows direct installation into hardwood timber (such as oak) or if combined with the correct plastic anchor it is attachable to almost any masonry surface. 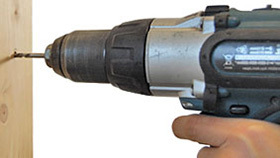 (we recommend a 1/8" or 5/32" drill piece for direct installation or a 5/16" or 3/8" if inserting a plastic anchor). 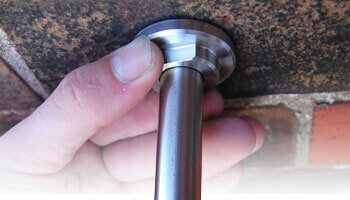 Screw in the dual thread pins in to place using a hex head key. Screw the surface mounting hubs onto the dual thread pins. 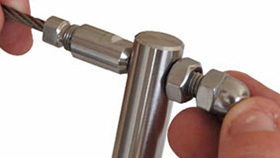 Perfect alignment of the cross hole can be achieved by simply turning the adjustable base plate of your hub in or out, to ensure a secure and rigid fixing. 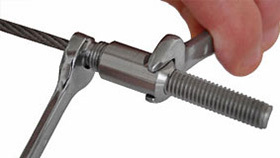 Thread your cable through the first hub, so that the fixed cable end can be secured - using a stainless steel nut (supplied). 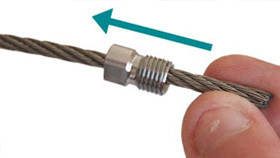 Remember to leave only a small amount of thread, so that as you tension the cable, more thread will be revealed to provide thread for the dome end nut. Place the DIY stud end in place through the other hub. 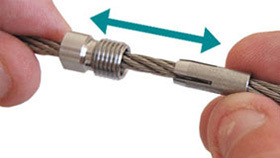 Now simply tension the cable by pulling and align to the spanner flat of the DIY compression fitting. 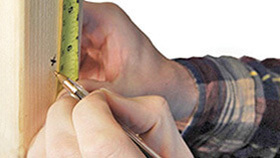 Mark your cable ready for cutting with either a pen or chalk. 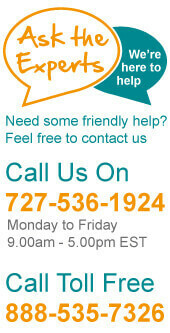 Cut your cable to required length. 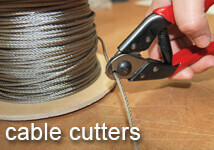 We recommend using a set of good Hand Held Cable Cutters to give you a neat and tidy cut. 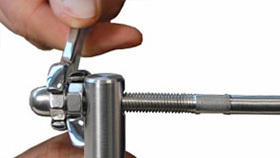 The first step is to take apart the threaded end stud by unscrewing the nose piece. 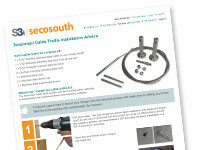 Place the threaded nose piece over the stainless steel cable. 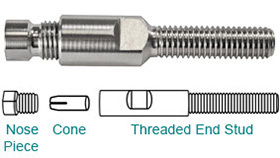 Place the cone onto the cable and push into the threaded nose piece. 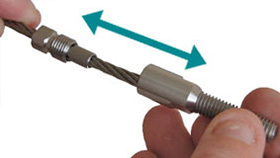 Take the stainless steel end stud and push onto the cable, bringing the three component parts together. Turn in opposite directions to thread them together. 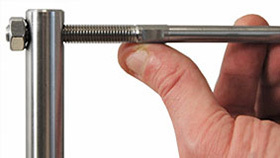 Using 8 mm and 9 mm wrenches (metric), screw the two sections together until tight. 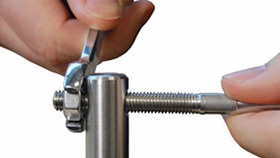 Now return to the pre-fixed cable end, using a 9 mm wrench (metric) simply tighten the stainless steel nut to achieve the desired cable tension. 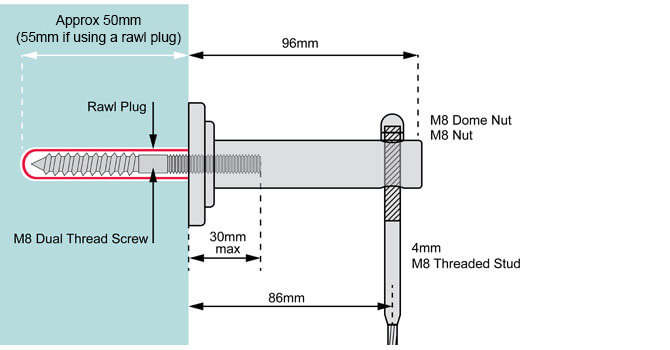 When you are happy with the cable tension, thread the dome nut on and tighten the nuts against each other.